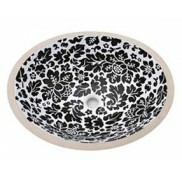 Add a little animal magnetism to your next bathroom renovation with one of our Animal & Nature design painted sinks. 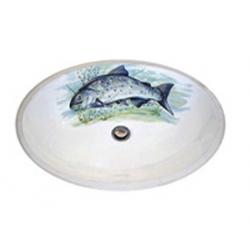 From Lodge or Cabin themed designs with fish, ducks or moose to the Cats in the Garden, Howling Wolves, Sea Shells on a bed of sand or a luscious Leopard or Zebra Print. Four beautiful butterflies painted with flowers and fruit including, strawberries, clover, poppies, .. 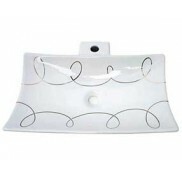 Create an enchanting atmosphere in the powder room on a pedestal lavatory with these delicately.. Beautifully painted wolves howling by the edge of a lake with rocky snow-capped mountains and a full..
We know there are plenty of animal print lovers out there. This leopard print glistens in a range of.. The leopard print glistens with a range of luscious shades of orange and golden-yellow tones with ri..
Add something special to your lake house or fishing lodge with the Muskie design on the sink! This f.. 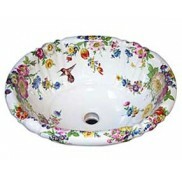 This sink features a variety of more colorful shells with red, green & blue highlights rest..